The DJI S1000 Plus has been specially designed for high level professional aerial photography and cinematography. 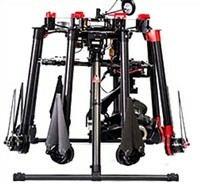 The DJI S1000 Plus OctoCopter comes as standard with retractable landing gear, folding frame arms and folding propellers to minimize storage space required when not in use or in transit between flights. Every detail of the DJI S1000 has been developed for the needs of aerial photography. The S1000’s V type mixer design provides large amounts of propulsion while improving the power efficiency. When the S1000 is combined with a DJI flight controllers like the DJI Wookong M or A2 flight controller, it will remain stable even with the loss of a one motor, propeller or ESC on a single arm. The DJI S1000 is approximately 4kg with a maximum take-off weight of about 10kg, the S1000 can easily carry equipment as heavy as a 5D mark 3, used with a 6S 15000mAh battery it can fly for up to 15 minutes. The gimbal's and battery are mounted to the same bracket, with dampers placed between the bracket and the frame. This significantly reduces high-frequency vibrations and makes shots clearer and sharper from the Zenmuse camera gimbals. The battery tray position also makes it more stable and convenient for mounting and dismounting.